Morningscore is a new up-and-coming SEO platform hailing from Danemark. They want to bridge the gap between SEO and business so that both consultants and business owners can correctly pinpoint the real value of their SEO efforts. In this use case article, we are going to find out how they are using Feedier to make sense of their user feedback and keep up with the constant flow of new users. The interview and discussion were made with Martin Khan, SEO specialist at Morningscore. Most of Morningscore’s users have advanced knowledge in IT and high expectations when it comes to design and UX. Hence, Morningscore was looking for a feedback tool helping them engage in a novel way, brushing off the boring and _skip_ aspect. Growing very fast, topping 3K users in less than a year, Morningscore needed a way to scale the feedback process, yet by respecting their users’ time. They essentially wanted something innovative, beautiful and nice design that would fit into their strong brand. I was fortunate enough to get in touch with Baptiste, the co-founder of Feedier, and he did a great job at explaining how we could seamlessly integrate Feedier into our flow. This ultimately helps us get the best results out of it. 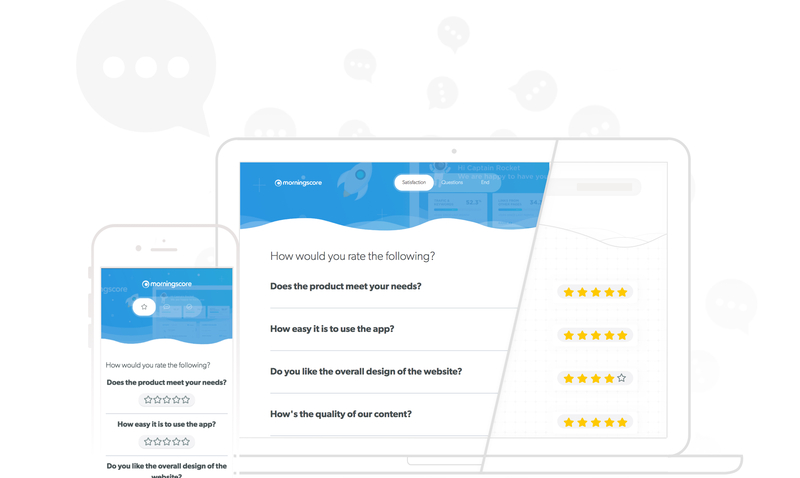 Additionally, since we see value in the gamification and offering rewards in platforms (we ourselves do it), we saw that the people behind Feedier had a clear primary goal – make a survey app where users actually want to submit an answer. What made me try the app was that I liked Feedier’s interface and the guides they’ve published on their blog were very helpful. It was also very clearly laid out how they compare to similar software so it saved me time doing all the research. Martin recalls the easiness to get started with Feedier, particularly emphasising on the personal call and the video walkthroughs. How Feedier fits in Morningscore’s processes? One of the ways Morningscore uses Feedier is to collect feedback during after the signup, so that we can gain valuable insights into their users and what they prefer. Their target market includes people who are working in SEO and digital managers at companies who are responsible for the SEO activities. The interaction that we saw valuable at first is right after their purchase. We wanted to learn more about what made our users sign up and which channels they’re using. With Feedier we were able to increase the response rates on our surveys and gain valuable insights about our users which I believe is due to the ability to present the content in a fun and engaging way, offering rewards at the end. Most of the tools out there have a dull or confusing interface, and it was quite hard to manage the responses. Also, the response rates to our surveys were always very low, so like many professionals, we believed that surveys are supposed to get low response rates. Thankfully, we saw that it doesn’t have to be this way by implementing Feedier in our flow. As a final note, Morningscore is using Feedier built-in survey incentive features in order to reward their respondents with a more advanced SEO guide. Listen to the video interview from Martin below. If you also want to scale your feedback process by using gamified feedback surveys, start for free at Feedier.com ?